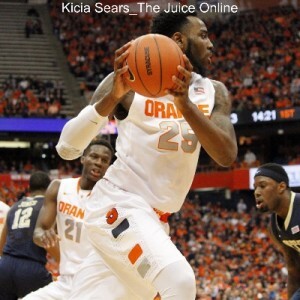 WHAT HAPPENED: Rakeem Christmas, saddled with four fouls throughout most of the second half, fouled out with just over five minutes left and the Orange clinging to a 49-41 lead. Notre Dame quickly cut the lead to three points, and pulled to within 59-57 with 40 seconds left after Jerian Grant was fouled on a 3-point attempt by Ron Patterson and hit all three free throws. But on the ensuing possession, Syracuse beat Notre Dame’s press resulting in a BJ Johnson dunk plus a foul, and SU hung on for its second win against a ranked team this season. ANALYSIS: If you’re into efficient offenses and high scoring games, this was not the game for you. Both offenses slogged through the game with SU shooting 40 percent from the field and Notre Dame at 35 percent. Syracuse was 4-16 from downtown and Notre Dame was 3-22. In other words, it was the exact kind of game Syracuse wanted to play against Notre Dame, which came into the game with the No. 10 offense in the country at 79.8 points per game and the No. 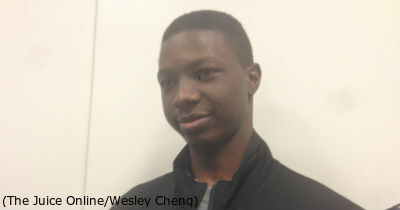 2 field goal percentage at 51.3 percent. Had Syracuse been eligible for the postseason, it would’ve been a second signature win coming a week after upsetting No. 12 Louisville at home. HERO: Johnson was a force off the bench, leading SU with 19 points on 7-13 shooting. Christmas went for 14 points and 12 rebounds before fouling out. 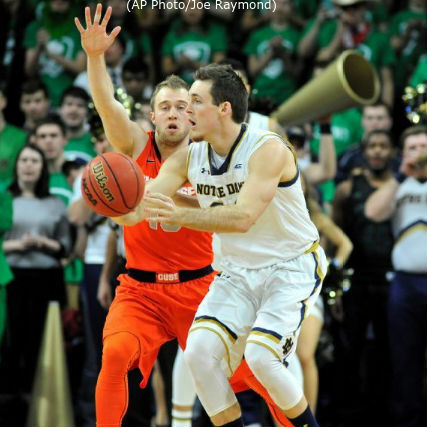 ZERO: Steve Vasturia was part of the offensive struggle for the Irish, shooting 2-10 and 0-6 from downtown. WHAT’S NEXT: Syracuse will travel to North Carolina to take on Duke on Feb. 28 at 7 p.m.